We get many emails and phone calls requesting values of newspapers found in attics, given by friends, or purchased at a yard sale, etc. We try to be as helpful as possible and ask for photos if they use email. This almost comical photo came in the other day–apparently with the thought that the headline was all we needed to see to determine a value. As you might imagine, we need to see more…..
Teachers with a love of history, listen up! The following resource can improve your curriculum and make you a stronger educator. Students of history will enjoy the breadth and depth of the historical journey as well. Teachers: Are You Engaging AND Empowering Your Students? Many of the posts include detailed images and reference accounts of actual Rare & Early Newspapers – most of which come from his personal collection. Ben fully grasps a foundational truth regarding primary sources: “History is never more fascinating than when it is read from the day it was first reported.” Thanks Ben, for your contributions to both the Rare Newspapers and Educational communities. Rag Linen also has useful information on the History of Newspapers, the Condition & Preservation of newspapers, and more. Well done Todd. Thanks for your contributions to the rare newspapers community. Printing in Connecticut began as early as 1710 by its first printer, Thomas Short. Short became an orphan at a young age and was captured by Indians & carried away to Canada. He was eventually ransomed, likely by his brother-in-law, Bartholomew Green, who taught him the printing trade. The Green family was well known as early printers throughout New England. Printing in New Haven began when James Parker, of New York, was appointed postmaster by Benjamin Franklin, although there is no evidence he ever spent much time either as postmaster or printer. He employed John Holt, of Williamsburg, Virginia, to manage the printing office. 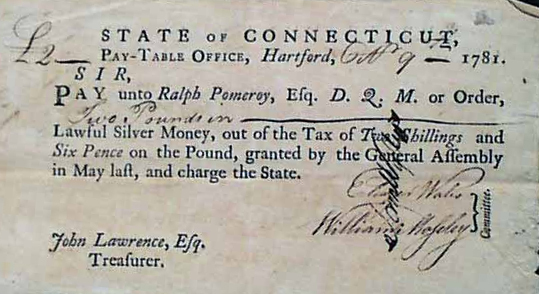 “The Present State of the Colony of Connecticut Considered” from 1755 is the earliest known production by James Parker in New Haven. On April 12, 1755 he brought out the first number of a newspaper titled the “Connecticut Gazette“, with Holt as editor. It was the very first newspaper printed in Connecticut and continued until Feb. 19, 1768 at which time it ceased publication. Just a few months later in Hartford, on April 25, 1768, the “Connecticut Courant” began publication and remains in print today as the country’s oldest continually published newspaper. What newspapers do you yourself collect: ones from a specific region or era or pertaining to a certain subject? Or are newspapers in general your collecting “area” and you just like the rarest, most historic items? What are the collecting areas within the hobby? What are some of the interesting collecting areas of some of your customers? How extensive is the hobby of collecting rare newspapers? Are there any other dealers at all who specialize in this? What are the “Holy Grails” of newspaper collecting? Are newspapers ever forged? For example, aren’t there a lot of professionally done reprints in England? What have newspapers been made of over the years, and how perishable are they? Are the high-acid papers necessarily hard to preserve? When was the transition from rag content to high-acid paper in the U.S. and abroad? The entire post is available for viewing at: Americollector.com. Thank you David for your contribution to the collectible. It’s always a thrill to find truly significant reports for very little money; proof that doing a bit of homework can be well rewarded. A fellow collector (to whom who owe a special thanks for sharing his “find”) shares the uncommonly lengthy letter from Merriwether Lewis while on the Lewis & Clark Expedition, datelined at Fort Mandan, April 7, 1805. It appears on two inside pages of “The Balance & Columbian Repository” issue of August 13, 1805. Typically reports on Lewis & Clark are very brief. This is is not.